The Best of Teacher Entrepreneurs II: Social Studies Lesson - "George Washington Carver"
Social Studies Lesson - "George Washington Carver"
Well, it is Washington Wednesday !! I created this unit along with my other "I am" mini units. Teach your students about George Washington Carver in a fun way!! 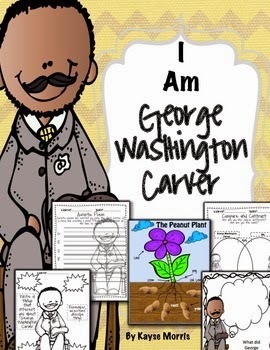 Use this George Washington Carver mini unit during Black History Month or any time during the school year. Page 2- What did George Washington Carver accomplish? Be sure to check out my other Black History Month Mini Units! !